Just one listen to Justin Robinson’s robust, multi-layered alto sax and its easy to tell that Charlie “Bird” Parker, the legendary bebop master, is one of his musical heroes. Yet, it is another titanic figure of jazz, John Coltrane that is reminiscent to the quiet confidence displayed in Justin Robinson’s approach. Indeed, as Coltrane is lauded as one of the most iconic characters in jazz, if not all music, it was Coltrane’s formative years with Miles Davis that not only helped to launch his solo career, but established him as the consummate picture of the sideman. For a good part of Justin Robinson’s career, he has created an impressive image of a sideman, a position he is comfortable and confident playing. Lending his amazing gift to such luminaries as Abbey Lincoln, Diana Ross, Little Jimmy Scott, Cecil Brooks III, and currently Roy Hargrove, Robinson began a rapid rise in various jazz circles by first studying with the venerable Frank West at fourteen years old. 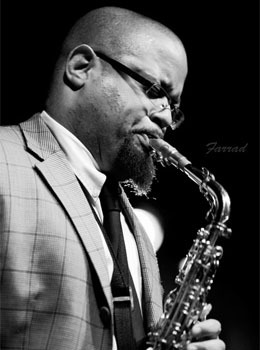 He then joined the hard bop duo, The Harper Brothers, in the late 80’s as a teen to record their record “Remembrance: Live at the Village Vanguard” and ran a jam session at the famed Blue Note Jazz Club from 1987-1990. In 1991 he debuted as a solo artist with “Justin Time”, produced by Bobby Watson and featuring some notable heavyweights such as Gary Bartz, Eddie Henderson and Kenny Barron—all before his 25th birthday. In spite of his lighting fast trajectory, Robinson, like many musicians, diverted his path from solo success as a leader to soaring reviews and steady work as a sideman. More Coltrane than Shadow Henderson, Wesley Snipes character in Spike Lee’s Mo’ Better Blues, Robinson has fit comfortably in this position due a desire to ensure quality through his music. “My journey was different than a lot of guys. More of my desire is to learn more about the music. It’s a maturation process. I’m more concerned about the quality of the music being played than being a star. I want to play good and make a contribution. Coltrane cared about getting better. He was concerned with being a better musician.” It is this quality, perspective, and humble confidence that cause Robinson to shine brightly in the company of both listeners and peers alike. Robinson eventually began to hit his stride as a fixture in Roy Hargrove’s Big Band and Quintet groups. He first met Hargrove at the Blue Note Jam sessions where Roy would stay jamming until 4am on consecutive nights, but it wasn’t until later that they began to work together. Dynamic enough to compliment Roy’s insatiable quest to elevate the music and cool enough fade back and let his saxophone do the talking, Robinson gives Hargrove’s band’s that necessary punch and soft caress that continues to rouse and sooth audiences worldwide. Constantly amazed by Hargrove’s following and all the places around the world they have had the opportunity reach people with music, Robinson and Hargrove recently played for Aretha Franklin and also at the Ambassador or Turkey’s home in Los Angeles, attended by U.S. Representatives, Maxine Waters and John Conyers. They are currently gearing up for a tour of Japan. Robinson, multidimensional and focused, along with being a family man is also a black belt in karate and brown belt in Gracie Jiu Jitsu, modern Brazilian jiu jitsu. He uses martial arts not only for discipline, but also to draw parallels to music. Both involve some level of improvisation, the ability to counter moves like knowing the bridge to a tune, and adjust and react to changes. It is this type of approach that confirms Robinson’s commitment to music quality, confidence in his contribution, and clear perspective from the side. Check out Justin Robinson’s music here.